Babes in Toyland is a Laurel and Hardy musical film released on November 30, 1934. The film is also known by its alternate titles Laurel and Hardy in Toyland, Revenge Is Sweet (the 1948 European reissue title), March of the Wooden Soldiers and Wooden Soldiers (in the United States). 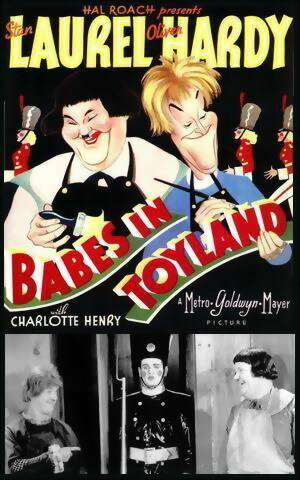 Based on Victor Herbert's popular 1903 operetta Babes in Toyland, the film was produced by Hal Roach, directed by Charles Rogers and Gus Meins, and distributed by Metro-Goldwyn-Mayer. The film was originally produced in black-and-white, but there are two computer colorized versions. Reviews from critics were positive. Andre Sennwald of The New York Times called it "an authentic children's entertainment and quite the merriest of its kind that Hollywood has turned loose on the nation's screens in a long time." Variety proclaimed it "a film par excellence for children. It's packed with laughs and thrills and is endowed with that glamour of mysticism which marks juvenile literature." "It's certainly far more successful than was last year's Alice in Wonderland, and the children will probably be far less bored by it than they generally are by those films designed especially for them", John Mosher wrote in The New Yorker. Film Daily called it "delightful musical fantasy" and "dandy entertainment". "It's been many a long day since I've had so much pure (and I MEAN pure!) fun as I had watching this picture", wrote the Chicago Tribune.